In chemistry, Water (Hydrogen Oxide), a clear, odorless, tasteless liquid, is a compound substance with chemical formula of H2O: one molecule of water has two hydrogen atoms covalently bonded to a single oxygen atom. The Ionization of water would mean a gain or loss an electron involved with the water molecule. Ionized Water is water that may be either alkaline or acidic, meaning that the pH has been adjusted up or down. Alkaline water is full of Hydroxyl ions. 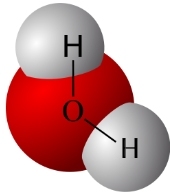 Acidic water is full of Hydrogen ions. Tap water is contaminated with two of the most toxic carcinogens (Chlorine and fluoride) known. And even this "purification" does not ensure that it will be free from parasites such as Giardia lamblia (Giardia intestinalis) and cryptosporidium. Parasites live in water. Drink plenty of pure water pure water (at least 8 glasses a day) to keep the kidneys flushed. Do not drink tap water whenever possible.